The Global Volcanism Program has no activity reports for Soche. The Global Volcanism Program has no Weekly Reports available for Soche. The Global Volcanism Program has no Bulletin Reports available for Soche. The Global Volcanism Program has no synonyms or subfeatures listed for Soche. Volcán el Soche, a small stratovolcano near the Colombia border, is the northernmost of a chain of Ecuadorian volcanoes east of the principal volcanic axis. This dominantly dacitic volcano was constructed over Paleozoic rocks and has a summit caldera open to the E. A major explosive eruption took place during the early Holocene at about 8600 years BP, depositing tephra NW into Colombia. The ejection of voluminous dacitic airfall pumice and pyroclastic flows was followed by the formation of two lava domes in the caldera. Hall M L, Mothes P A, 2008. Volcanic impediments in the progressive development of pre-Columbian civilizations in the Ecuadorian Andes. J. Volcanol. Geotherm. Res., 176: 344-355. INECEL, 1980. Estudio de reconocimiento de los recursos geotermicos de la Republica del Ecuador. Inf Geovulcanologico Realirado Aquater/BRGM/OLADE, unpublished rpt. There is no Deformation History data available for Soche. There is no Emissions History data available for Soche. 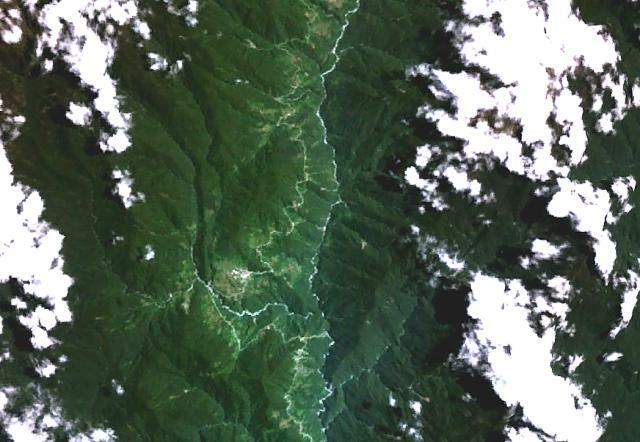 The small forested volcano left of the center of this NASA Landsat image, its eastern (right) flank traversed by a winding road, is Volcán el Soche. This small stratovolcano near the Colombia border lies just west of the Río Chingual, which vertically bisects this image. Soche is the northernmost of a chain of Ecuadorian volcanoes east of the principal volcanic axis and was the source of a major explosive eruption during the early Holocene. The village of La Bonita (lower left-center) lies at the southern end of the volcano. There are no samples for Soche in the Smithsonian's NMNH Department of Mineral Sciences Rock and Ore collection. Large Eruptions of Soche Information about large Quaternary eruptions (VEI >= 4) is cataloged in the Large Magnitude Explosive Volcanic Eruptions (LaMEVE) database of the Volcano Global Risk Identification and Analysis Project (VOGRIPA).